"Thoughtful and absorbing, the piece demands concerted effort from its audience, and rewards close attention with a tantalising glimpse into how the connections that make up our existence might be formed, in all their fragility, and as such lingers in the imagination long after the final moments." "(…) the past presses itself on us at every moment. Life Forces examines this paradox, this process of fitting oneself into family narratives, of trying to interpret and remember, while each individual holds their own strand, coming together around shared objects that resonate. And while the mind is constantly reworking events, the body never forgets, and forever holds and plays out every emotion, every experience, if only we’re able to listen to what it tells us." You can read a review by Belinda Dillon, EXEUNT here. "…Life Forces is a profound meditation on the roots and influences of creativity. It is a work that builds and maintains an intriguing dialogue between past and present, between the act of creating and what has already been created…"
"…Mason has a quiet intensity about her that is the life force of the work, developing it element by element with concentrated deliberation, with Smith as a touchstone, an emotional base on whose shoulders she can climb with confidence." "I just wanted to say a huge thank you again for bringing Life Forces to Decoda! It was a joy to host you here. I was really moved by your work and I know others were too." "How can little knowledge move someone so much?" "Not knowing much of this piece has left me with a stronger impression." "I found myself lost but it’s like I didn’t want to be found. It was beautiful." "I struggled to understand the piece as a whole, parts I really understood but others I really didn’t. Life and death, storing things, sizes of things?" "It’s amazing how just the quality of your touch towards the objects and each other moved me. It’s a wonderful feeling being moved without any context." "I was truly moved by your moving, your words and text. I thought the piece was lovely." "I felt as though a lot of time passed like I was watching years go by. It tugged at my heartstrings. Sentimental – this is where I am at. I enjoyed watching the gradual build of the space. I appreciated the pace giving me time to notice myself in the process. I want to see my dad! "Moving, beautiful, feel content after a journey. Thank you." "Very interesting – breaking contemporary barriers. Very enjoyable." "What a journey – time space. – life growing & dispersing – thank you." "The sort of piece I have to go home and think about. Loved the collaboration between the two of you…beautiful work!" "Very moving. Delicacy and a raw power. Bursts and sparks. Bits of humour, space. Intriguing intensity. Acceptance. Time. Enjoyed the light and props and presences. Thank you." "Loved it! Very engaging and captivating, – Thought provoking. Thank you. I really enjoyed the evening"
"I was involved in the memory of the work, the intricacy of it, the sense of a character, a figure, behind it. Very thoughtful and thought provoking." "What an astonishing, tender, moving performance. I was wholly taken into the heart of this piece – so much was said with so few words and the music was beautiful. Slow, attentive, timely – it added up and you took me into the great sadness of grief and loss and then brought me back up to the surface again. The circle was complete. And I loved what happened with the plastic bag – the spirit here, in form, briefly, and then gone again. Thank you both so much for such a graciously composed and performed performance." "A beautiful performance – stillness – intention and presence – connected to me as an audience member fully – thank you." "It was astonishingly beautiful! I loved it so much. I feel a bit speechless about it because it said almost everything, for itself. Very thorough, complete, spacious, wonderful work." "Comrades - just to let you know the performance last night was amazing – if you get the chance to see it in Bristol then do go - it's incredibly moving, poignant, sculpture, immersive - well done to Jane Mason and Phil Smith – a stunning piece of work." "Having just arrived home my head filled with imagery from your wonderful performance tonight I just had to email to say thank you for a very moving and memorable evening. So much of what I saw tonight had such resonance for me it’s very difficult to articulate what and why, but maybe that doesn't matter. The beauty and integrity of the physical & artistic relationship between Phil & yourself was outstanding. It filled small and beautiful movements with such depth and tenderness that I wish I could have captured them on film (still) not to analysis them but simple to fully visually absorb them. The subtlety/beauty of your movement/choreography filled me with admiration…"
"I had quite varied responses to the work that night, if I'm honest....I liked the aesthetic of the piece very much, Sophia's tactile, sculptural design I think is lovely - gives a feeling of interaction to us even though we are just sitting there. I found the complicite of Jane and Phil rather moving. Feels like there is something really going on - their fragility and the play on strength & dependance had a lot of meaning for me. Two such different bodies and energies holding endless stories… So perhaps my reservations are on where my connection to the overall meaning of the piece lies. I fretted at times that I wasn't 'getting it' - and I'm not usually prone to worrying about 'narrative' and these kinds of constructs. But for me there was a lightness that felt shy of digging deeper. Which felt a bit odd, particularly when on paper the thematics are pretty profound. It goes without saying that this is totally subjective. It's a quality, interesting piece." "Jane and Phil enveloped me into their space and journey, where collages of human and material form join, dismantle and leave imprints and memories are explored, felt and leave residue. A gentle, fragile and very human performance with a presence in the now...it felt like it was made for this very moment in time, for us, their witnesses." "A very absorbing - and sometimes challenging – piece. Just what makes for a good experience! A beautiful and thought provoking evening." Beautiful work last night - a big thank you. I was hooked." I felt like the plastic bag simultaneously full of air and suffocating - insignificant and momentous all at once - like this was the last breath. (...) sometimes it's easy to get a bit disillusioned with performance – this was beautiful and intelligent stuff.... Thanks again..."
"I love, love, loved the performance. I was so pleased to be a part of that. "Thank you so much for last night. I had a sense of witness position: witness to each other, witness to yourselves, the objects as witness and perhaps that was also the invitation to the audience, to be there as witnesses." "I really loved the work and I’m astonished at how much it has progressed since I saw it at the first sharing at Siobhan Davies Studios. It feels as though you have been paring away at it - adding some new things (I really like the animated circle) and taking some “stuff” away. The opening action, banging the straws, is incredibly strong and the text and the movement now feel much more integrated. The honesty and humour are heartbreaking and a splendid respite all at the same time and I love how you and Phil co-exist on stage. You are so different and yet so perfect together. The piece is minimalist yet so full of shapes! It’s so hard to write about this kind of work - there are so many layers and complexities; it comes at you sideways, and it feels sacrilegious to reduce it to marketing copy. Anyway, thanks to you and Phil for a life/art-affirming evening in the theatre. I can’t wait to see it in Bath." "I just wanted to write and tell you how much I enjoyed coming to see your performance the other night. It was so beautiful and thought provoking, I found the movement and imagery you used to explore the concept of change, memories and loss amazing and really very moving. I do not usually go to see this kind of performance. It was such an interesting experience and so different from anything I have ever been to see at a theatre. I feel really inspired now to go and see other performances which will challenge me to think rather then just easily entertainment me - so thank you for a lovely evening and well done for what you have achieved." "I loved the abstract yet emotional narrative in relationship (also) to the objects. The world, connection to space presence time. Thanks!" "Found this very poignant and really enjoyed the use of your props, particularly the long tubes. Very meditative." "Meditative… still processing the piece! Tender and grounded. Enjoyed the contraction and expansion… like cells." "Really enjoyed the balance between narrative and non-narrative components. Fascinating to watch the construction of shapes and object manipulation." "Really beautiful, an opportunity to get lost in another world.."
"Beautiful. So peaceful. So intense. Thank you." "Truly one of the most moving pieces I have ever witnessed. I feel connected." 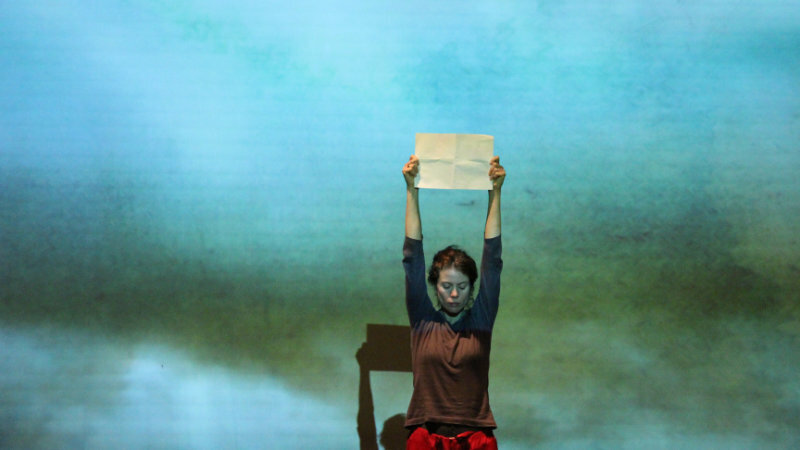 "A beautiful show - profoundly moving and contemplative."